Just milliseconds before landing, it takes a series of digital photos of a mystery blotch on the horizon that is dubbed “the galactic equivalent of the Zapruder film.” No one knows what it is or what it could be. Just as soon as it’s noticed, it disappears. The machine lands gently with the aid of a hovering sky crane, a few nylon tethers, an umbilical cord and a supersonic parachute. The machine lies dormant in its crater for weeks, silently conducting tests on itself before spontaneously coming to life. It travels methodically on its six wheels, stopping only to take high-resolution video and photographs along the way, sending the images back to its home planet at hyperspeed. When it reaches its first mission site, the machine is ordered by an alien with a Mohawk to use its nuclear incinerator to vaporize rocks and ingest soil. The machine is not the first to be dispatched to the planet—another preceded it, and ultimately was swallowed up in a deep sand trap. But this machine is more capable. More formidable. And it is the advance party for other machines, and other manned spacecraft to follow. … This could easily be the storyline for a Robert A. Heinlein novel, or another sequel from the Terminator series. But, of course, this isn’t science fiction. At least… not anymore, it isn’t. Everything I just related describes what happened with the landing of the Mars rover, Curiosity, a little over a week ago. The nuclear rock melter… the 7 Minutes of Terror… the Crime Scene? All true. Even the alien controller with the Mohawk is real—NASA activity leader, Bobak Ferdowsi, wore that hairstyle for Curiosity’s landing. The mission is also true-to-life. 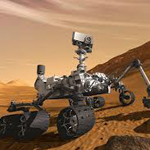 Curiosity is a robot—a very capable, intricate robot, equipped with a nuclear-powered lab that was built with the sole purpose of measuring the potential to live and work on Mars. A few decades ago, I sat beside an unassuming elderly lady on an airplane, who—when pressed—finally introduced herself as one of NASA’s chief scientists. Her task, she told me, was to find a way to send a manned mission to Mars. We talked during the entire flight as she knitted a sweater for her grandson. I was fascinated. Could such a mission be possible? Watching Curiosity’s landing last week, however, I couldn’t help but think we were a little closer to sending a manned mission to the red planet. The sheer engineering genius behind the mission was something to behold. The extensive testing, refinements and risk mitigation efforts were the result of teamwork across a broad array of disciplines and organizations. Reading all of the accounts from the Curiosity landing, I imagined myself as a newly arrived NASA engineer. “We die,” the landing team director says, walking away. Think about it. If Curiosity had augered in, what would that mean for the future of America’s space program? Ultimately, this is why the Curiosity’s mission to Mars is so important. To all of us. It conveys the creative, scientific and engineering genius of our nation at a time when it would be easy for us to be collectively pessimistic. The team that put Curiosity on Mars was extremely diverse—men and women of all races, creeds and colors, working together, worrying together and, ultimately, celebrating together. If you’re an optimist, Curiosity means we’re still pushing the envelope. It means we’re still interested in understanding more about what lies physically beyond us. Curiosity reflects what’s best about America, and the enduring importance of missions like hers. So, if you’re an idealist, Curiosity also conveys that we all still want to be part of something that’s larger than us.